Summer is upon us and people are firing up their grills across the country. Whether they be year round grillers or just fair weather grillers, I bet more grills get fired up this month than any other of the year. Regardless of which camp you fall into, it’s always a good idea to periodically check your thermometers to make sure they are reading accurately. Both your grill thermometers and instant read meat thermometers. I was reminded just how important that was last night when I went to fire up the MINI. Don’t get me wrong, I love my Mini Egg, but it hasn’t seen a lot of action lately. If you told me I had used it less than five times this year, I wouldn’t be surprised. The Large has been seeing all the action lately as we’re usually grilling both proteins and veggies. Last night, however, I was only doing brats and so it got the nod. I lit it per my normal method (paper towel soaked in oil, shoved through the bottom vent and lit), sat down with an ice cold glass of tea and started to read while occasionally tossing the ball to Oliver, our German Shepherd, when he would actually bring it back. I’d glance over at the Mini every so often to see how it was doing. 200F. Gonna be a bit longer. Read some more. Still at 200, maybe a bit higher. OK…something is not right here. Peeked down the top vent and there was plenty of red hot coals. Held my hand over it. NOPE. That ain’t 200F!! Thermometer must be completely out of whack. 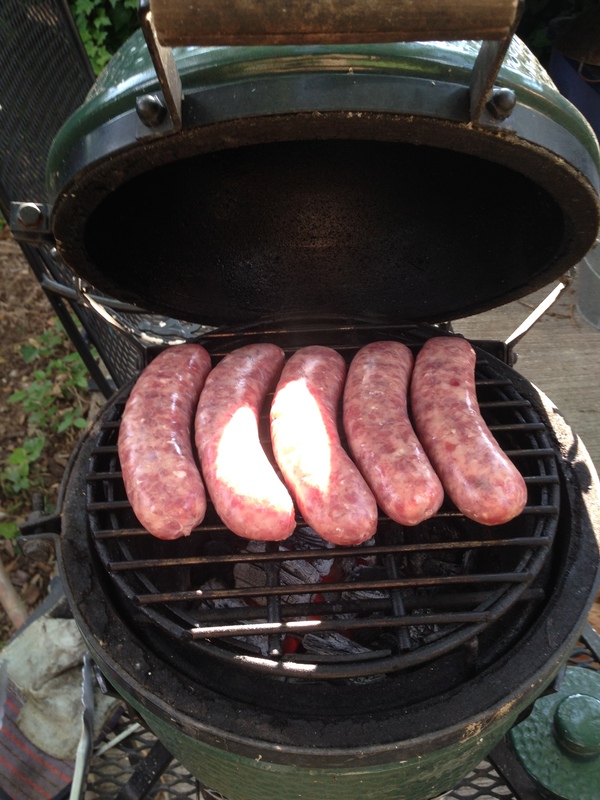 Closed my vents to where the normally are for a 350-400F cook and tossed the brats in anyway. 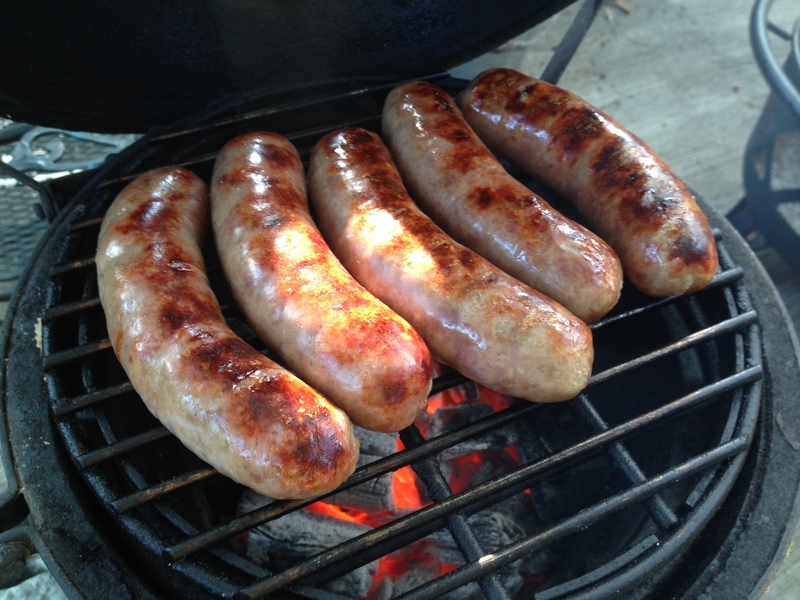 So basically I cooked the brats blind, I had no idea what temp I was at, but I forged ahead anyway. Wait a few minutes, turn, wait a few minutes, turn again. Listen for any sizzling that would be an indication that they were too hot, the skins had split and juice was leaking down into the coals, which is a bad thing, of course. While this was happening, I thought back to grilling pre-BGE. Years grilling on kettles, offsets and gas grills. Grills that either did not have thermometers or ones that read LOW-MED-HIGH. I reminisced about holding my hand over the heat and counting how long I could hold my hand there to give me an indication of how hot my grill was. A great trick every pitmaster should know and one I’m glad I learned. I figure I was somewhere in the 350-400F range. 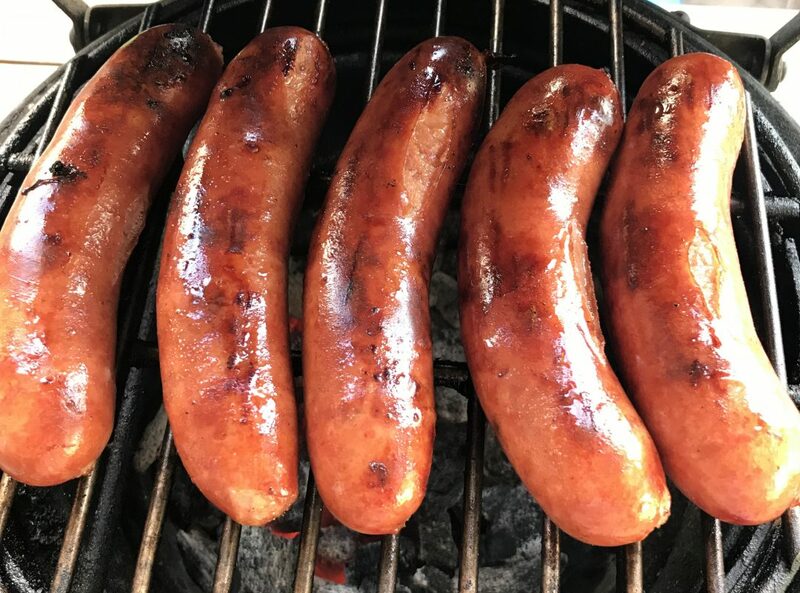 Thankful that I have those skills and don’t need to rely on a thermometer.When the brats were done, I pulled them and checked the thermometer one last time. Dead on 200F. Yep, definitely out of whack. 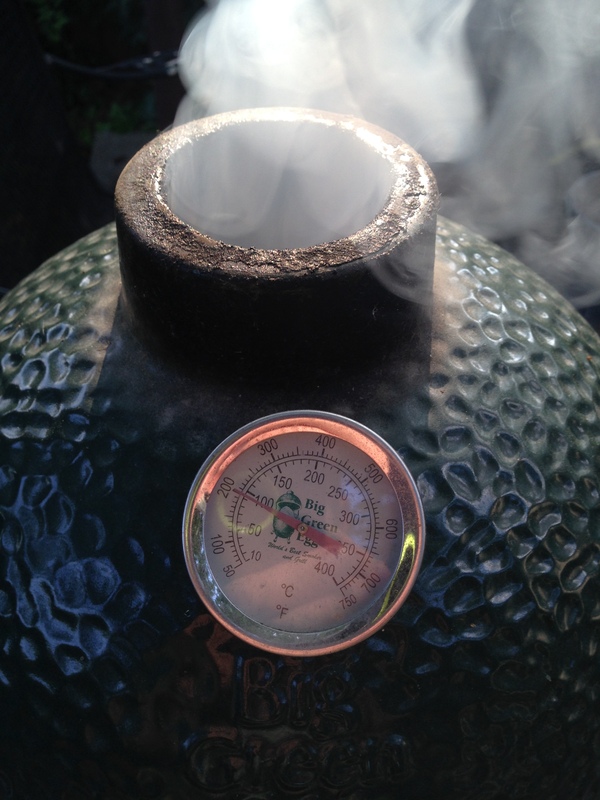 So how do you know if your thermometer isn’t calibrated? There’s two easy ways. You can submerge it in a glass of ice water and it should read 32F. Obviously, with my thermometer, that trick won’t work since it only goes down to 50F and who really cares if its accurate at that end of the scale? The other thing you can do is to submerge your thermometer in boiling water. You remember science class, right guys? What temperature does water boil at? That’s right. 212F. Plus or minus a bit depending on altitude and barometric pressure and all that. You can try and get all precise, but if you are in the 210F ballpark, I’d call that good enough. What do you do if your thermometer is off? I can’t speak to all thermometers as there are so many out there, but if its one like this or a Tel-Tru, there should be a nut on the back. Use a wrench and turn the nut until the dial reads 212. Clockwise will make it read higher, counter-clockwise will make it read lower. Only slight adjustments should be necessary to dial it in to 212F. As for me? I’m probably just going to toss mine. It’s the old school thermometer that used to come with the Egg. I’m not sure its even a Tel-Tru, which is what they come with now. To be quite honest, I kinda recall that the stem got bent awhile back and I had to put quite a bit of force into it to bend it back. I don’t exactly recall what I did to bend it, but ever since I’ve been moving my new Tel-Tru thermometer from Egg to Egg depending on which one I am using. I just forgot last night. After bending the stem, I’m not sure it even works anymore. I’ll just replace it with a more accurate thermometer. Heck, maybe I’ll even look into seeing if there is a digital version out there I could use…. Next: Next post: Happy Friday the 13th!! And Happy Father’s Day!! Amen and amen! A small but very important detail that’s often overlooked. Since you have the water boiling go ahead and check those meat thermometers too.